Washington Gov. Jay Inslee gives his State of the State address to a joint session of the Legislature on Jan. 15, 2019, in Olympia, Wash.
Amid clips of him repeating warnings about global warming for years, Inslee argues that the crisis can't be ignored any longer, saying that it "isn't just a chart or graph anymore. The impacts are being felt everywhere." He closes by saying he's "the only candidate who will make defeating climate change our nation's number one priority." 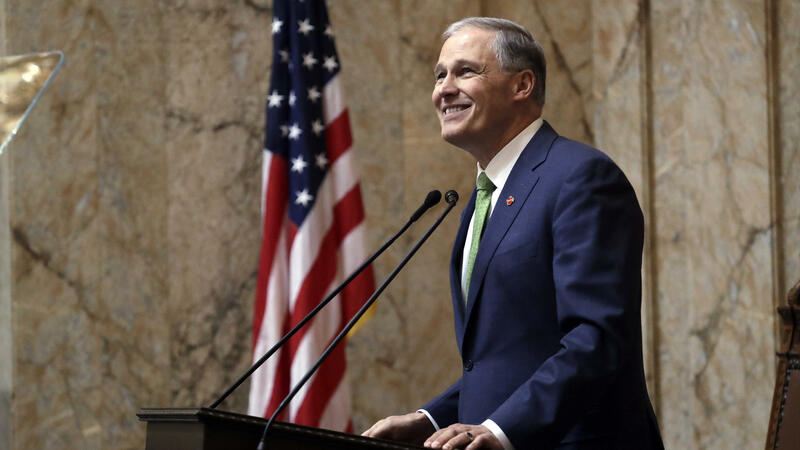 While governors are frequently dominant figures in presidential primaries, Inslee is the first sitting or former governor to join the race for the Democratic nomination. Montana Gov. Steve Bullock, former Colorado Gov. John Hickenlooper and former Virginia Gov. Terry McAuliffe are considering 2020 bids. Inslee isn't a well-known politician like other top candidates that have already entered the race, such as Massachusetts Sen. Elizabeth Warren, Vermont Sen. Bernie Sanders, California Sen. Kamala Harris, New Jersey Sen. Cory Booker and others. But Inslee is the first to make climate change the central facet of his campaign, which could help him carve out a unique niche. The issue is a rising concern among progressives and millennials especially, evident in the recent push for the Green New Deal in Congress. "I've been pleased by what I've been hearing across the country," the 68-year-old Democrat said last Sunday on CBS's Face The Nation. "That people do want a president that will act on a real emergency, which is climate change." Inslee has long tried to raise alarm over the issue, dating back to his tenure in Congress. In his 2009 book "Apollo's Fire: Igniting America's Clean Energy Economy," Inslee compared fighting climate change to the space race. In 2017, he co-founded the U.S. Climate Alliance, a bipartisan coalition of 21 governors pledging to take action after Trump withdrew the U.S. from the Paris climate agreement. "I do think that it is absolutely imperative that the Democratic Party put forth a candidate who will make climate change a principal, front-burner issue, rather than some peripheral back burner," Inslee told Rolling Stone last year. As governor, he created the Washington State Clean Energy Fund, investing over $120 million into clean energy research and use, along with expanding transit and light rail service and increasing electric vehicle and alternative fuel tax credits. However, some of his plans hit a roadblock even in his liberal home state. A ballot initiative that would have placed a statewide fee on carbon pollution failed in November, but Inslee said he was not dissuaded. "I learned one of the key talents is persistence," Inslee told NBC News. "Climate change is not going away, and neither are we." Inslee has made visits to early primary states, but he may not get the warmest reception in them all. Politico reported that when he was chairman of the Democratic Governors Association he decided not to invest in the 2018 gubernatorial race in New Hampshire, upsetting many state Democrats. Under his DGA chairmanship, the party flipped seven states from GOP control.